Perdido Towers, far from the crowds, located on brilliant white beaches, nestled between blue-green waters of the Gulf of Mexico and the peaceful solitude of Old River. 500’ of beachfront to enjoy from your balcony or a walk on the beach. Keypad entry to the buildings provides security and units have a private or semi-private entry from the elevators. 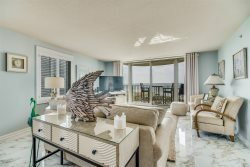 Beautiful, 1400 SF, 7th floor East end unit with spectacular views and floor-to-ceiling windows and doors overlooking the beach. Ceramic tile throughout. Each bedroom has a private bath which makes it ideal for two couples. Electronics include TV's in Living Room and Master Bedroom. I am honestly blown away by the team at Perdido Realty. Not only did I make a late reservation but I had a service dog that was made to feel at home on the property. We had to make some modifications and the ladies in the office were right there to make it a non issue. Thank you so much for easing our concerns and making this an experience to remember. We really love the Perdido Towers and have stayed there many times. Unit 705 was a different experience for us as we usually stay on the ground level. It was very pleasant and I must say that the views were spectacular. We will be back!